For the past few days System 90L, a low pressure center far south-southwest of the Azores, has been monitored by the National Hurricane Center (NHC) for possible development into a subtropical or tropical storm. This low pressure area was producing winds of over 52 knots (60 mph). The Atlantic hurricane season runs from June through November so a tropical storm developing this early in the year would be unusual but not unprecedented. On Jan. 12 at 12 a.m. EST RapidScat saw System 90L's strongest winds southwest and southeast of the low pressure center at 24 meters per second (53.6 mph/86.4 kph). Maximum sustained winds are not always equally distributed in a tropical cyclone and the RapidScat instrument helps forecasters find the strongest quadrants of a storm. RapidScat is an instrument that flies aboard the International Space Station. 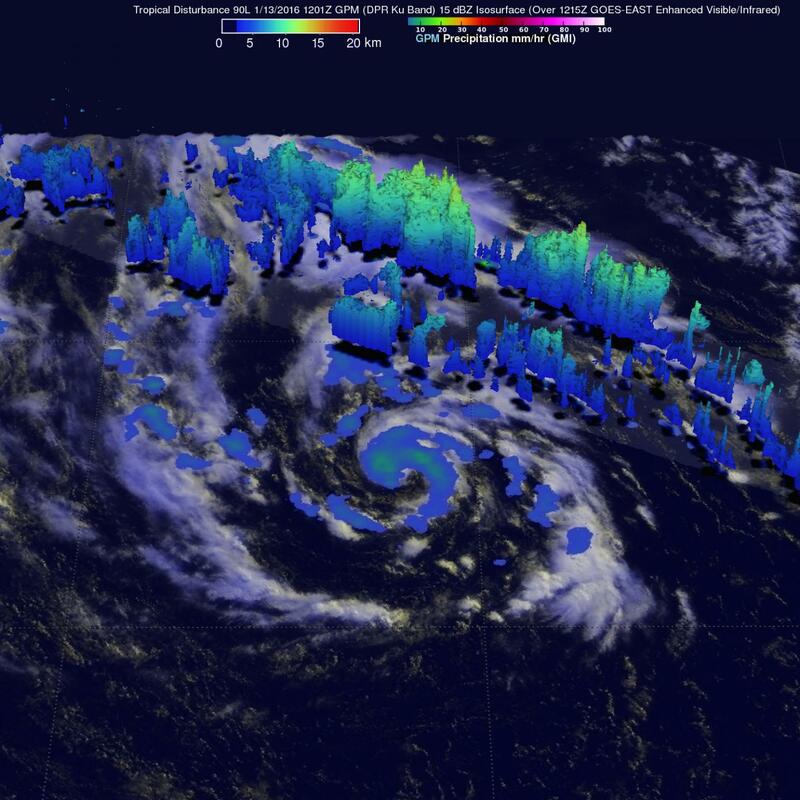 The GPM core observatory satellite is a joint effort between NASA and the Japan Aerospace Exploration Agency. GPM had an excellent daytime look at System 90L on January 13, 2016 at 1201 UTC (7:01 a.m. EST). GPM's Microwave Imager (GMI) and Dual-Frequency Precipitation Radar (DPR) unveiled the rainfall pattern around this low pressure center. Precipitation derived from DPR showed that rain was heaviest in an intense band of storms east of the low's center of circulation. Rain in a few powerful storms was measured falling at a rate of over 94 mm (3.7 inches) per hour. A 3-D examination of the precipitation within this band by GPM's radar (DPR Ku band) found that some storm tops were reaching heights of almost 12.5 km (7.8 miles). At 1:05 p.m. EST on Jan. 13, the National Hurricane Center noted that "Cloudiness and thunderstorms have become a little better organized since yesterday near the center of a low pressure system centered about 850 miles south-southwest of the Azores. If this organizing trend continues, advisories will be initiated on the system later today. The low is producing winds to near 50 mph over the southern portion of its circulation [as RapidScat also observed on Jan. 12], and is expected to move northeastward and northward over the eastern Atlantic over the next few days." NHC noted that interests in the Azores should monitor the progress of this system and strong gusty winds could begin to affect portions of those islands by late Thursday or early Friday, Jan. 15. The NHC gives this low pressure area a high chance to develop into a depression over the next two days. For updates on System 90L, visit the NHC website: http://www.nhc.noaa.gov and Meteo France: http://www.meteofrance.com/accueil.